Most people are not aware of this, but Lil Wayne has done plenty of good deeds in his life to help out others. You can view which kind acts Weezy F Baby has done throughout his career below! In 2007, KRS-One re-launched a campaign called “Stop The Violence Movement”, which first launched in 1989. 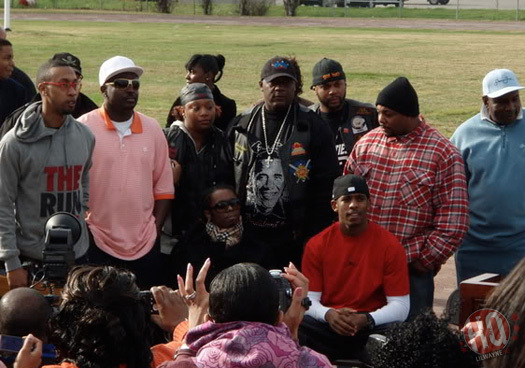 The campaign was started to try and lower violence by getting hip-hop artists to speak up and raise awareness to listeners. Other rappers other than KRS-One who support “Stop The Violence Movement” include Lil Wayne, 50 Cent, Ludacris, Rick Ross, Chingy, Cassidy, and Immortal Technique. You can watch footage of Weezy recording his public service announcement messages for the campaign in the clips above and below! After the Hurricane Katrina disaster in 2005, Lil Wayne helped rebuild a park that was damaged in New Orleans, Louisiana by donating $200,000. The reasons behind this donation are that Weezy used to play at the park when he was a kid growing up and he hoped it would inspire other music artists to help out with donations. In 2012, Wayne went back to this park and shot a music video for his collaboration with T.I. on a song called “Ball“. Lil Wayne recorded vocals for the “We Are The World 25 For Haiti” charity single, which was released to benefit the people of Haiti after the earthquake that struck in 2010 leaving over 300,000 people dead and over 1 million homeless. The charity single, which was produced by Quincy Jones and Lionel Richie, was a remake of the 1985 “We Are The World” song and was released on February 12th, 2010. A music video for the single that you can watch above was also released to promote the track. At the end of 2010, Lil Wayne gifted the mother of Ronda Austin, who is called Evelyn Austin, with a Quantum 6000 wheelchair. Weezy got to know Ronda through numerous letters that she had sent him while he was locked up behind bars in Rikers Island. In these letters, Ronda wrote to Wayne explaining how much of a fan she was, as well as writing about her family. Tune then rang her up on the phone and mentioned that he will take care of a problem she and her father were having with purchasing a wheelchair for Evelyn. This good deed from Tunechi has allowed Evelyn to get out the house for the first time in years. Watch Ronda Austin and her family tell the story in the clip above! Every year for Thanksgiving Day, Lil Wayne and his Cash Money Records family hold a turkey giveaway in their hometown New Orleans, Louisiana. 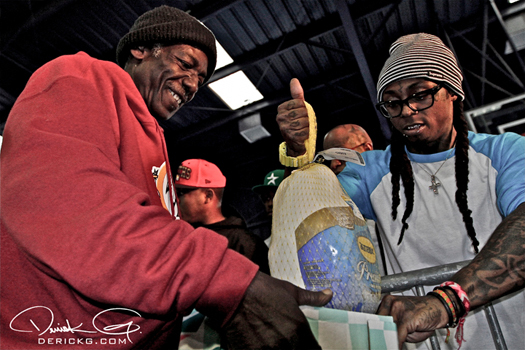 Weezy and the CMB crew give out around 1,000 turkeys to families from their city, so that they can enjoy the holiday. On September 26th, 2012, Lil Wayne opened up his TRUKSTOP skate park in the Lower 9th Ward Village of New Orleans, Louisiana that he built along with Mountain Dew. Weezy decided to build this skate park where he did, because it was one of the worst places hit by Hurricane Katrina back in 2005. Watch Wayne talk about why he opened up the TRUKSTOP skate park for the kids of New Orleans above! A soldier named Lander Chappell was clearing a road of improvised explosive devices in Afghanistan when he accidentally stood on one that went off. He had lost his leg and he was losing a lot of blood, as well as drifting in and out of consciousness. One of Lander‘s solider friends kept talking to him while they waited for doctors to arrive and asked him to sing his favorite song. Chappell then sang Lil Wayne‘s “Tie My Hands” song featuring Robin Thicke until help came. Lander‘s leg has now been fitted with a prosthesis. 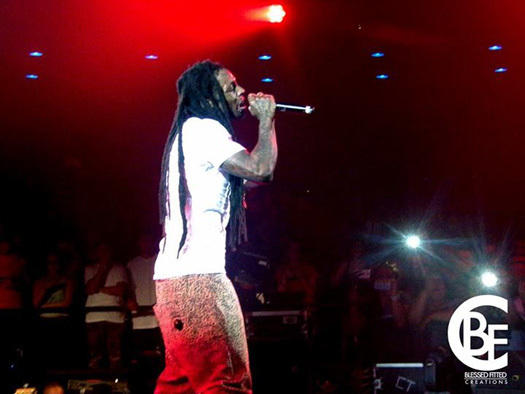 Lil Wayne performed live at a benefit concert on September 3rd, 2013 in Phoenix, Arizona to support the Carter Fund. All of the proceeds from the show went towards the Carter Fund charity, which is an organization that holds after-school programs for the youth in the United States of America. 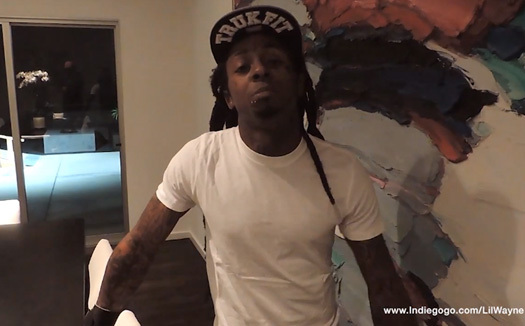 The Motivational Edge teamed up with Lil Wayne to launch a campaign called “Indiegogo” in October, 2013. The campaign offers after-school programs to the youth that tries to motivate them in life with self-confidence and to do well in education. “Indiegogo” is currently trying to reach a goal of $200,000 to help spread their after-school programs across the United States of America. Weezy has contributed $30,000 to the campaign.